The Gift of Drawing. 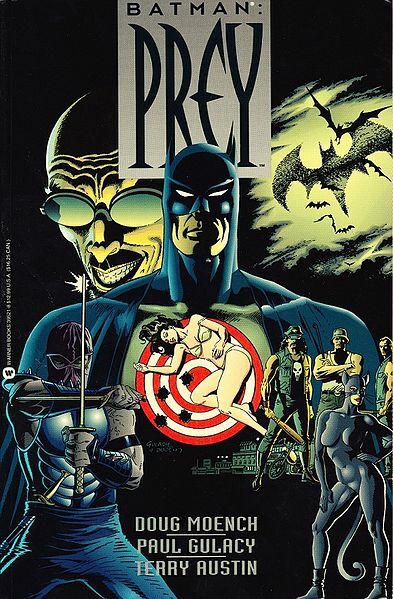 Batman, Bill Tate, and Harvey Pekar… | Ty Templeton's ART LAND!! When Christmas rolls around (as it did last month), our family goes for the home-made gifts quite a bit. We make ornaments, cookies, quilts, home-made stuffed animals…and that sort of thing. Oh, sure, we buy video games for OUR kids, as they’re too pushy to ignore if Call of Duty XII is out, but in general, we like the thoughtful, homemade presents to give to cousins, uncles, grandparents, and the like. This year, for instance, for my mother-in-law, the entire family performed a production of the Birth of Jesus (I played Herod -as killing the first born sons of entire villages has long been a hobby) which went over very well. But sometimes, I do folks a drawing. And since it’s ART LAND around here, I can share ’em with you guys. 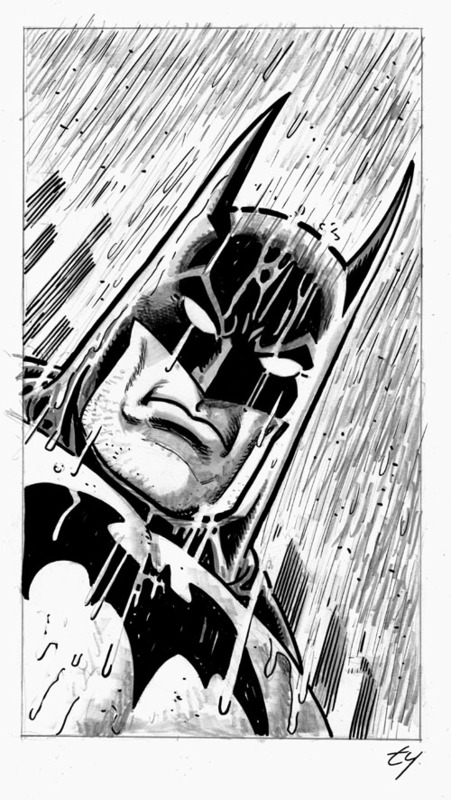 This shot of Batman looking wet and rained on was for the nephew of one of my wife’s friends. I’m happy with how it turned out, mostly because it’s fun for me to see influences creeping into my drawing brain. I had JUST finished reading a Paul Gulacy mini-series the day I started this sketch, and the Gulacy-ness of the style I drew surprised me when it was done. An example of the same style of drawing, only done with more skill. And no, I didn't have this in front of me when I drew my lesser sketch above. I’m a chameleon like that. If I’ve just read something by Kirby, I draw a little like Kirby. If I’d just seen a Picasso, lord help the kid getting the sketch, he’ll cry and ask why Batman has three eyes. 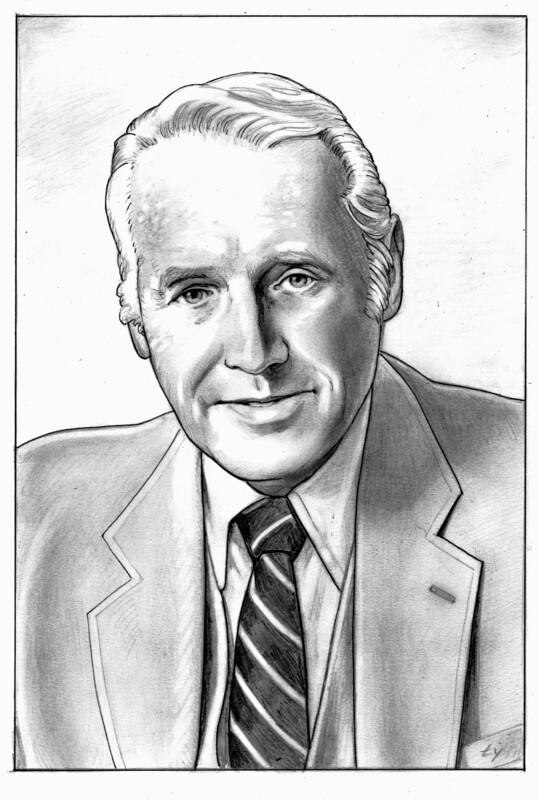 It’s a portrait of my stepfather, Bill Tate, who passed away in 2008. I did it for my mother’s gift this year. It’s pencil on drawing board, about 10 x 15, and you’ll have to trust me, it looks like him. I don’t do “sustained” drawings much in my biz…it’s usually about the quick drawing, get in, get out, and move onto the next panel, so it was a pleasant change to work on the same image for five or six hours or so….getting the likeness, working the tones, playing with the textures of hair, skin and cotton. Makes me suddenly wish I was a portrait painter, and all this nonsense with the webbing and bat-costumes was a passing fancy. Ah, who am I kidding? I’m a comic book guy, and wouldn’t change it for the world. Now, I gots to get back to drawing super-heroes, or else they take away the house and car. 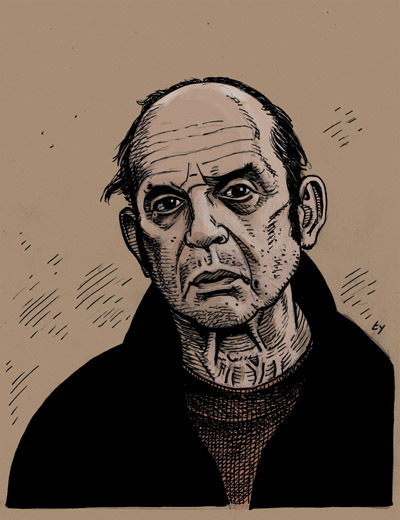 My posthumous portrait of Harvey Pekar, printed in Strange Tales 2 #3, which came out JUST before Christmas, last month. Can you tell I was reading something by R. Crumb the day I drew this one? I am truly Zelig Templeton. This entry was posted in Harvey Pekar, Unseen artwork and tagged Batman, Bill Tate, Harvey Pekar, Paul Gulacy, Portraits. Bookmark the permalink. It’s actually quite a relief to read this confession of yours. I always assumed my being impressionable stemmed from the fact I was a mere amateur. Now I know I’m an amateur strictly on the basis I’m terrible at sketching, and not because I tend to steal elements from far more talented folks like yourself. I wonder what would happen if you drew Batman after viewing some of Magritte’s work? You can read it there, but I don’t encourage scanning comics.